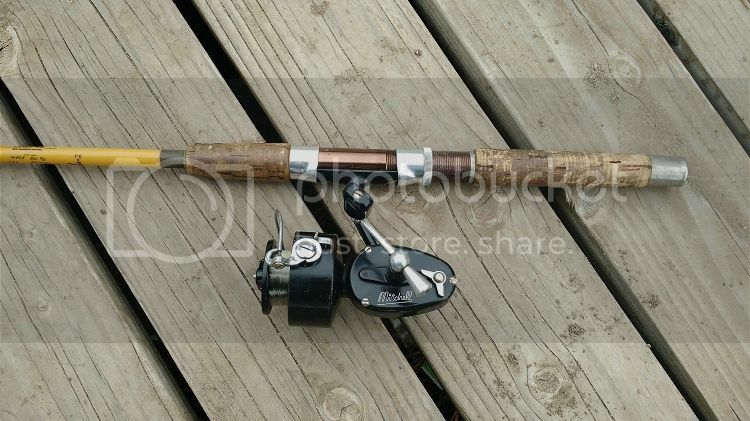 I have used the spinning reel and rod every year since I got it. The fly rod gets used, but not as often. 42 years later I still have both, and it is still in great condition for the use it has seen, and I will be using it again this year. I have to admit though, I do have some newer ultra light rods and reels that I use too, but they just don't have the personality that the old one does. I found myself about a year ago slowly acquiring more Mitchell reels. It wasn't really intentional, but I really started to enjoy buying them, cleaning the ones that need it, and learning the history on the different models. As it sits right now, I have 19 vintage Mitchells. Various 300's including one half bail, a 408, 410, and a very early production 314 CAP. I've had a few that I have sold, but am still on the lookout for new additions to my small collection. Today I stumbled onto an original CAP reel that I am trying to find out info on. I am really enjoying the time I spend here reading, learning and enjoying pictures. That is a great looking reel to have that many years on it. I bought my first 300 in 1963 when I got out of the Navy and I still use it. It looks like a piece of junk, and I've painted it several times, but still works well. I have talked to a lot of people that are in the same situation as we are and have old Mitchells setting behind the door that they grab when they head for river. long they can last. Much the same as your reel that you described. rods and reels are much like the old guns. They were well made, and built to last generations if taken care of. They worked great 50 years ago, and some things even 100 years ago, and still work just fine today. guide here, am I correct that would make it a 51/52 version 4 ? I'm not sure of the exact numbers, but he has quite a few. I know some are still NIB. He also has numerous reels that he still has all of the paperwork and boxes, but are reels that he still fishes with. His users are also in almost new condition, and are mounted on vintage Fenwick rods from the same era.